Food Wishes Video Recipes: Spicy Shrimp Etouffee - If You're Texting the Recipe Just Enter "A2FEY"
Spicy Shrimp Etouffee - If You're Texting the Recipe Just Enter "A2FEY"
For whatever reason, I've recently been on a Cajun/Creole cooking kick. Here's the finished shrimp etouffee video recipe I promised last week, and man, was it good! 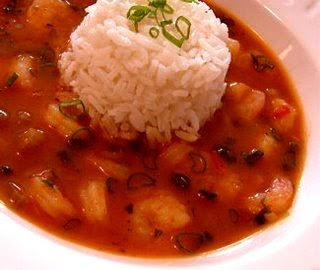 Etouffee is one of New Orleans' most famous dishes - it's spicy (or can be), aromatic, brightly flavored, and very comforting, all at the same time. Etouffee comes from the French word for "smothered," and I would describe the dish as a rich, shrimp gravy served with rice. In general, Creole cooking is not that common for the average home cook. I think, from a distance, it may look like Creole cooking is fairly complicated. While some recipes do have lots of steps, most of the classics, like this shrimp etouffee, are quite simple to make. Speaking of famous New Orleans recipes, folks in my age group may remember with some amusement, the blackened redfish craze from the early eighties. Chef Paul Prudhomme, of K-Paul's Louisiana Kitchen, introduced America to that old Cajun favorite, blackened fish. It was later discovered it wasn't even a Cajun recipe, but that's a chef for you - we never let the facts get in the way of a great story. This was a smoke alarm's dream recipe. Blackened redfish is basically a fillet covered in spicy dry rub, and seared on a red-hot cast iron pan. This is a great recipe when made under a massive restaurant exhaust fan. At home, it produced copious amount of smoke, which forced many a chef outdoors. Anyway, enjoy the video and be sure to give this easy, and smoke-free, recipe a try! For the bowl rice trick: You can use water. Now that right there was funny-I don't care who you are. I am stunned. Chef John pronounced Worcestershire. I enjoyed this and the other videos. thanks, i've been practicing in my spare time. Ha! Don't let him fool you - that was a voice-over from Dictionary.com pronunciation! Just got back from a week in New Orleans yesterday. First time. Fantastically unique place. Terrific food, people, music, hot weather, and residential architecture. All just as amazing as you've heard about. One of the best overall restaurants I've ever been to : Jacque-imo's. Wow. A great experience. Never even heard of etouffe until I got there. Delicious. Can't wait to try this one. In the recipe though, you forgot to mention the humidity. When do I add the oppressive NO humidity? glad you had a great time. yes, i've heard the humidity is brutal... "the air you wear." The trick is to sleep all day, stay out all night, and wear very little. For some reason on Bourbon Street you'll see girls on the balconies, and with the slightest provocation, they pull their tops above their... well you get the idea. Yes, that humidity is something else! By the way, this is also awesome diet food. I skip the rouex (butter and flour). You miss a little of the flavor (not a lot), but you are left with a very low fat, low calorie tasty dish. Use brown rice instead, and it's actually health food. Thanks for this recipe! I'm wondering if I could use cooked shrimp instead of raw shrimp? I've found a great deal on cooked shrimp via shrimp rings at my local grocery store. Would this change the outcome of the recipe very much? never cook cooked shrimp! if you can help it. I'm coming in here late but wanted to say I cooked this last night and it turned out great. I have tried so many recipes from all over the net but none could come close to my favorite cajun haunt. Even the guy who says "BAM" all the time couldn't pull it off. The reason???? I believe the 25 minutes of simmering has a lot to do with it. Anyway, great job chef....I loved it. I'm allergic to the shellfish, so would scallops be a good substitute for this recipe? i believe scallops are also a shellfish! Oh I know scallops are, but for some reason, I'm not allergic to them. It's a strange thing lol. Chef John, is the heat turned up to cook the shrimp or is it low heat through out the whole process? Chef John, it seems that your video and ingredients were taken down. Can you point me in the right direction of send them to me. I found the recipe on allrecipes, but it's just written instructions, no video. But I'm trying it tonight!